My usual burger fare is a quarter-pound of organic beef topped with caramelized onions and mushrooms. After a while, this standby can become tiring. As it so happens, yesterday was my CSA’s first farm pickup: lettuce, spinach, radishes, garlic shoots, and a healthy bag of basil were waiting in my kitchen. Finding creative ways to eat these plant goodies over the summer will be a priority. The decision for Thursday night: pesto-topped burgers. Why pesto? Basil and garlic are major ingredients of pesto, and I have a surplus of each. Luckily, I only needed to buy pine nuts and ground beef. I stopped by my food co-op and snagged a pound of ground beef from pasture-raised Scottish highland cattle. Apparently they didn’t have pine nuts so I grabbed a reasonable quantity of hazelnuts and checked out. Prep 3 cloves of garlic. Cut up a little bit of block Parmesan cheese. Toss in some pine nuts or hazelnuts. Blend together in a food processor or blender. Add olive oil to create a little bit of a mixture and continue blending. From there, burger set up proceeded as normal. 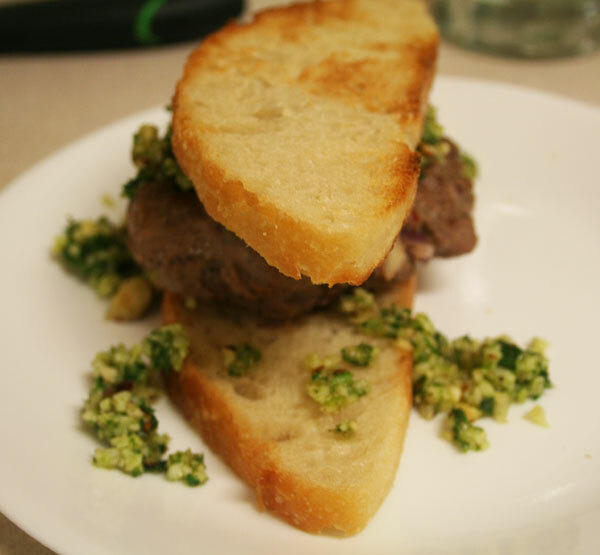 After the burgers were finished, they were placed on lightly-toasted ciabatta (from a local bakery) and topped with the homemade pesto. Because there was plenty of spinach and lettuce available from the CSA, salads were a logical choice for side dish. And though it may not have been the perfect move, I paired this with a bottle of Bel Lago NV Red Table Wine. All-in-all an incredibly satisfying meal.